State Titles, Banners, Impact Apparel Gift Certificates, Participant Giveaways, Coaches VIP Hospitality Suite and Giveaways and an amazing Competition Atmosphere for all in attendance! $1,000 Cash Prize, Banner, and Impact Apparel Gift Certificate will be awarded to the highest scoring Varsity Cheer Team. $1,000 Cash Prize, Banner, and Impact Apparel Gift Certificate will be awarded to the highest scoring Varsity Dance Team. $500 Cash Prize, Banner, and Impact Apparel Gift Certificate will be awarded to the highest scoring All-Star Dance Team. Grand Champion Banner, and Impact Apparel Gift Certificate will be awarded to the highest scoring Junior High/Freshman team and highest scoring JV team. CLICK HERE to Nominate a Coach or Advisor! Thank you for taking the time to nominate a Coach or Advisor! 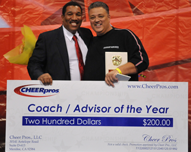 CHEERpros has established the Coach and Advisor of the Year Awards to recognize the outstanding cheer and dance coaches and advisors in the State of California. We appreciate all the hard work and dedication these leaders put towards coaching and mentoring athletes. Announcement of the finalists will take place during the awards ceremony at the California State Cheer & Dance championships. Each finalist will receive a plaque. The coach and advisor of the year will take home a cash bonus! NOMINATE YOUR COACH OR ADVISOR TODAY!